A supplier of components for the wind turbines needed a new drive for its manipulator with which he transported large gears in a curing oven and after the hardening process to further editing. The previous drive consisted of a spindle gear unit. Due to the increasing load on the drive, a rack and pinion drive should now be used. The new drive was designed with ATLANTA racks Class BR (Basic Rack) Q10 hardened, Module 2, helical toothed. To mount the racks in line, there has been used an ATLANTA Companion Rack, which is interlocked in the opposite direction and is suitable for a division accurate mounting of the racks. As angular gear two ATLANTA B servo worm gear a = 63mm were used, which were each equipped with a pinion shaft with key connection. 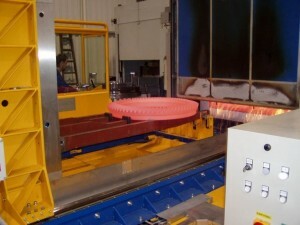 For a permanent lubrication of the drive there was used an electronically controlled lubrication unit with felt gear.